Eliminate intrusive dust and dirt with this 18" aluminum mop head. When used with 18" wet and dry microfiber flat mops, this aluminum mop head makes quick work of everyday mopping. These things seem to work well for quick easy jobs that aren't too dirty. Certainly won't clean like a traditional mop, but does a decent job. I ended up getting a larger size though. I bought this mop frame to replace my wife's garbage Swisher, it actually worked better than the swisher and buying the nig box of pads saved us a ton. The frame to the pole and mop head all popped up as recommended options, so I was sure to get the correct set. It works great for our hard floor surfaces. I ordered a couple of these to use for the first time and am very happy with how well they function. The swivel is smooth and I love how easy it is to use the velcro pads. My only concern is that the plastic seems a little cheap and I am concerned about the durability. So, at first I really like this mop! It was smooth and worked really well. The head/pivot area was working fine. We've used it a few times now and it sits in the corner of the shop. I think it matters what kind of mop pad you use. The one recommended, I ordered a few and it runs very smoothly on the floor. Then I ordered a different brand and it's very sticky. You can't push forward. The pivot head area just gets stuck and then bends in a way that you can't do a mop motion with it. Hard to explain. It does a great job mopping up wet areas when the head/pivot area works/stays up right. Soaks up rain water brought in by customers on a rainy day. Thank you for the review! 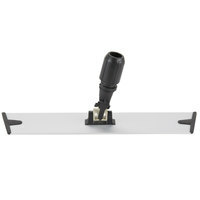 The mop heads we recommend as items you may also need are guaranteed to work with this mop frame. If you need recommendations for a different type of mop frame, please contact our Customer Solutions team! This 18" Alluminum Microfiber mop frame is amazing as far as size and floor it covers! You can get your floors done in a snap. Compared to the usual residential floor cleaning equipment. Yes I would recommend this item! I have a small cleaning business, and this is the best mop head I’ve found. It is very sturdy, and the Velcro doesn’t get debris on it like the others I’ve used. For the value, great product. Has made cleaning our wood floor a breeze, saves on mops and buckets and messy mop heads. Great product for simplicity and ease of use. The mop base is sturdy, allows very free movement of the mop head, and attaches cleanly to both the head and handle. The price is good, especially for such a solidly made item. It's good to use, easy to put dust mop pad on, and the I like the good build quality, may get another one one size bigger. Once you purchase all the parts- the mop frame, the telescoping mop handle, the flat mop pads and the microfiber dry dust mop- you are good to go. You will have one tool that sweeps, dusts, and mops your floors. The 18" mop/dust mop frame is larger than a home-use product, but it actually works remarkably well, especially maneuvering around toilet areas. Probably the best thing is that the mop pads and micro dust mop pads are machine washable- and you also can buy the mop pads color coded to use in specific rooms. Altogether, a great product that I am happy with, and will continue to buy more mop pads as needed. This is the mop frame we attach our microfiber mop pads and the 3M duster sheets to. Excellent stuff because it is aluminum so it is light and sturdy. These mop frames work great with the Handles that I had previously purchased. The frame is very sturdy and has stood up to every job I have tested it on. I will definitely be purchasing one for each of my employees. These 18" microfiber frames are perfect for either wet or dry mopping a floor using a standard microfiber pad. Collar tightens to secure the frame to any straight pole or broom handle. These microfiber mops are great for floors that you don't really want to scratch up. You just need to get a handle and a pad to go with this and you can use it as a dust or damp mop. It does grab the micro pads pretty well but the only thing that bothers me is when I go back and forth the, the pulling back motion causes the pad and the plastic base to flip over. Not a huge deal but when your in a hurry and moving at a good pace, then it becomes really annoying. They should have made the plastic base tighter or put a plastic stop on it so the base wouldn't flip back. The mop frame is a decent length and not too wide. It turns nicely and holds onto the towel that you are using to clean with . Strong frame and fits great with the 18'' microfiber pads. I really like the 18'' size as it covers a lot of the floor in minimal time and effort. I have to clean carefully with my new cork floor. This mop frame is adjustable, lightweight and easy to use and stores compactly. It is not heavy at all but cleans easily. Purchased this for a QSR. The head is not easily controlled by the base. It flips over all the time, and then eventually broke. Would not recommend. This frames works perfectly with my other sticks and the price is cheap and so worth it. Highly recommended if anyone is looking for something reasonable. I love this mop frame for my home. I bought it because we have all laminate flooring and it is great for everyday dry sweeping. Would buy again. Some may think that all microfiber mop frames are the same but there is more to it than that. I have gone through quite a few mop frames but this one is the best and mot durable I have used. Great product at an even better price. it can be real handy when it comes to small spaces, I use it every day, it can be used for wet mop or dust mop pads. The velcro attachment to the mop and dry mop is really simple. I am not sure how long the tab to lock the swivel will last...it doesn't seem really strong but then we probably won't use that function super often. Employees at our company do not like using this mop frame because the mopping pads do not stick to it. This makes mopping more difficult. Thank you for your review, Chad. We are sorry this mop frame did not work well for you. We recommend trying this Unger SM40R 16" Cleaner EZ Flat Mop Holder instead for a mop holder that will firmly secure the pad for easy and hassle-free cleaning. These Aluminum Microfiber Mop Frames add a new dimension to cleaning. I have 1,000 square feet of tile in my home and these microfiber mops with the corresponding pads make cleaning so much easier. Regular mopping means the mop head is continually immersed in dirty water. With these pads that are velcroed onto the frame you just take off, run under clean water, reattach and finish the job. My floor is cleaner and I am happy. If you have not used these, try them. I promise you will be not be disappointed. Love this microfiber mop frame and even better because it swivels making cleaning the floors a super simple task. Nice large size to cover more surface area. We really did not have a good experience with this mop frame. Nobody at our business really liked it because it flips over when you're using it no matter how hard we tried to prevent it. The flat part also kept separating at the joint which you can pop back in. Eventually it broke completely. We bought a lot from webstaurant that is good quality but this was not a great product. Thank you for your review! We're sorry to hear your mop frame broke. For a more heavy duty mop, try this Unger DampMop Pad Holder. Premium product, solid strip of Velcro holds tight to the microfiber mops. Terrific for janitorial applications where you want a quick rinse and low moisture... don't forget to order a handle! This mop frame has been in my house for about a year now and I received it from this website! Still works perfectly and the width of the head allows for fast and easy clean up with fewer swipes! This is a nice compatible aluminum mop head! It works well with both wet or dry mop cloths! Great price and easy to install on most mop sticks!